Glowy: Baby Luna Legend is The Newest Member Of The Baby Yeezy Sneakers. Baby Luna Legend is The Newest Member Of The Baby Yeezy Sneakers. First it was North West then Saint West, Dream Renee Kardashian and now John Legend's daughter Luna Legend. Read: North west and baby Dream Kardashian rocking the baby yeezy sneakers. 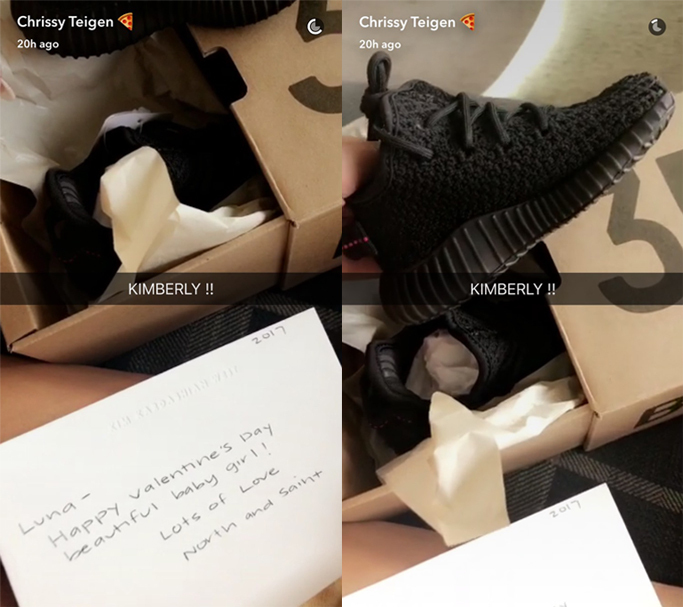 When you friends with the right people, you own the right things...lol.. Kim Kardashian West gifted Luna a pair of the Yeezy Boost 350 V2 sneakers in “Core Black/Red” for Valentine’s Day and attached with the shoe was a card wishing Luna a happy Valentine’s Day signed from her own kids, North and Saint. I wish to own a pair of this sneaker cos mehn am so in love with it. What did you get for valentine? share with us in the comment section. 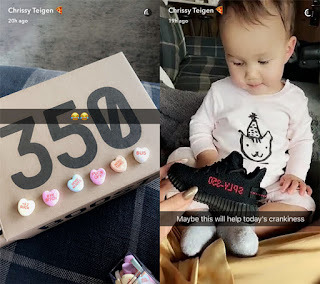 Labels: Baby Yeezy, Chrissy Teigen, Luna Legend, Sneaker. Lovely! Io ho ricevuto dei fiori ...inaspettati!